"The hit arcade racing game, Wreckless: The Yakuza Missions has finally arrived on the PlayStation 2 and pays homage to the arcade racers of yesteryear!" Wreckless: The Yakuza Missions is set on the streets of Hong Kong that is one of the most richly diverse cultures of the orient. Unfortunately for the good citizens of Hong Kong, the Yakuza have taken over the streets and not even the police force can stop them. Unable to stop this new terror themselves, the government have called for the help of the Dragons, an elite police unit and the two international spies who have been given the task of ending this threat. Your mission is simple, rid the streets of Hong Kong from the Yakuza, defeat their leader Tiger Takagi and use extreme prejudice. Okay, the plot isn't the most ingenious storyline to date but it actually kind of works. In the game, you can play the role of the Dragons or the Spies who have access to a variety of different vehicles and weapons. 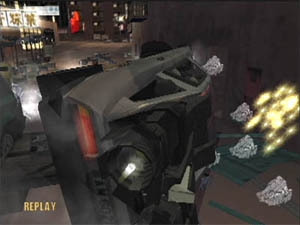 There are also over 40 missions in the game that allow for some high speed gaming action. The game supports three different difficulty settings that range from easy to difficult and by completing the missions successfully, the game opens up various new levels, cars and cheats that you can access. 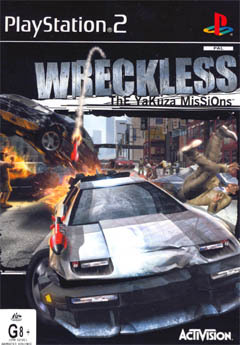 In its most purest essence, Wreckless: The Yakuza Missions is an arcade racing game that has been cross bred with a demolition derby game because you must race around the streets of Hong Kong and destroy enemy cars by driving into them. You also have access to weapons such as rocket launchers that can be used to help destroy enemy units that is similar to games such as Spy Hunter. 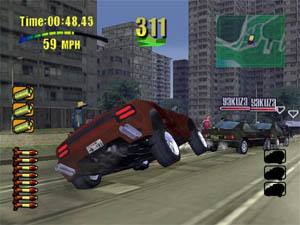 The missions involve a variety of objectives such as destroying a convoy of Yakuza cars, protecting vehicles from the Yakuza or taking photos for evidence to name a few. These varied missions also help the monotony of racing games by keeping each mission different. By completing the missions you are awarded various medals from bronze, silver and gold, depending on how long it took you to finish the mission. This award system also opens a variety of cheats that actually improve the longevity of this game. The biggest improvement of Wreckless on the PS2 is the control system of the game that has been greatly improved over the clunky and difficult XBox system. The controls of the game are extremely easy to pick up and you basically use the analog stick to control your car while the main pad is used for accelerate, break and fire your missiles. The control system also feels more like a traditional arcade racing game because of the speed and power of the cars, not to mention the extremely entertaining ability to destroy just about any object in the game such as fences, bins, cars and a variety of other destroyable objects. 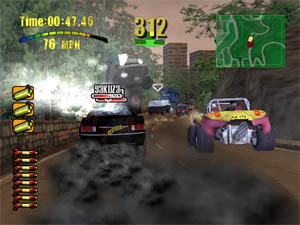 Apart from the improved control system, the PlayStation 2 version also offers gamers new levels, cars and a multiplayer mode. Graphically, Wreckless: The Yakuza Missions is an extremely mixed bag on the PlayStation 2 and unfortunately lacks all the lustre of the XBox version. I should reiterate though that the graphics on the PlayStation 2 don't look that bad but it does look a little dull in comparison to the XBox version. The game itself runs at a very professional 60 frames per second but all the reflective surfaces and lighting effects that made the XBox version so popular have unfortunately gone the way of the Dodo on the PlayStation 2. However, it's still a good effort, considering that the game originally came from a more powerful system. The cars of Wreckless on the PlayStation 2 contain a fairly high polygon count for some detailed looking cars that are extremely well animated and really do portray an arcade style of gaming. I commend the developers for adding literally hundreds of pedestrians in the game that can actually be run over if they get in the way and not to mention the myriad of traffic that is spread out throughout the city of Hong Kong itself. The backgrounds are fairly detailed and the developers have also done a good job at recreating this mock version of Hong Kong that has a sense of depth and is pleasing on the eyes. It should also be noted that the game contains hardly any popup which is a big bonus to gamers. Wreckless also contains some great CGI cutscenes between the levels that helps move the story along. The sound effects of Wreckless contain all the right sounding noises, explosions and crashes that you would hopefully expect to hear in a blockbuster Hollywood movie chase scene. The game also sounds great when hooked up to a decent home entertainment theatre system, especially when you are racing through a busy street in Hong Kong. The voice acting of the game is extremely cheesy, even amusing at times but that's what Wreckless is all about, a fun arcade racing game that pays homage to the games of the 1990's. Wreckless: The Yakuza Missions won't grab your attention for too long but if you are looking for a fun game to keep you amused for short periods of time, than this could be the game for you. The longevity of this game is a little strange because the difficulty of missions varies greatly and sometimes one mistake can cost you the game. Although not a 100% port of the XBox version, the PlayStation 2 version has enough extras and improved playability to make this one stand apart from the original.